Net Entertainment has brought Scarface, the legendary film from 1983, to the reels. The movie tells the story of the rise and fall of the Cuban immigrant Tony Montana that took over a Miami drug cartel in the early 1980’s. The movie was directed by Brian De Palma, written by Oliver Stone and holds one of the best performances from Al Pacino. The slot machine has 5 reels and 20 pay lines for you to bet on. In addition, you will be able to enjoy some amazing video clips from the film, a variety of features such as different free spin games and one of the coolest bonus features in the online casino industry. As intense, gritty and memorable as the story that inspired it; the Scarface video slot brings players into the life of the legendary Tony Montana where money is power. “Say hello to my little friend”! Net Entertainment is known for their high class and cutting edge products. Scarface is no exception. While you play this slot machine, you will be very entertained by the video clips and special effects that will appear. The sound effects are as dramatic as the movie and it adds to the exciting atmosphere. Scarface is a great slot machine that delivers the best from the iconic movie. The overall impression is fantastic; Net Entertainment has produced one of the most entertaining and exciting slot machines. The main characters from the movie, Tony Montana, Manny Ribera and Elvira Hancock, are all Wild symbols in this slot machine. Each of the 3 wilds represents a special game feature. The wild symbols substitutes for all other symbols except for the stacked wilds. The lower paying symbols are the card deck symbols, 10 to Ace, but there are also some additional character symbols from the movie included in this slot machine as well. The 3 different stacked wild symbols award you with different bonus features. When the stacked wild of Manny Ribera appears on the 2nd reel, the Nudge Spin feature is triggered. The Nudge Wild is automatically nudged down one position while the other reels, and the symbols above the Nudge Wild, re-spin for a chance at bigger wins. The Nudge Spins ends when the Nudge Wild no longer appears on the reels. If the stacked wild of Elvira Hancock appears on the 4th reel, you have triggered the free spin feature. This feature gives you 15 free spins that can be re-triggered while playing the feature. The Free Spins are played at the same bet level and coin value as the round that activated Free Spins. Bet line wins in Free Spins pay win amount X3 excluding any Bonus Game winnings. - Bullets - kills the enemy in the selected square. - Grenade - kills the enemy in the selected square and all enemies in adjacent squares. The Bonus Game is played with 1 of 450 scenarios and the maximum coin win in any scenario is 8000. 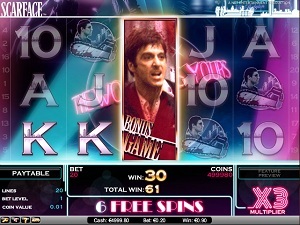 Scarface from Net Entertainment has 5 reels and 20 pay lines for you to bet on. The minimum bet per line is 1 coin and the maximum bet is 10. Note that you can set the value of your coins from 0.01 up to 0.50 of your game currency. Scarface has an auto play function which is very comfortable to use. You will activate this function by clicking on the AutoPlay button in the lower part of the game window. « More slotmachines guides Article last updated: Thursday, September 20, 2012.